Augustine was born into a wealthy family who provided him with an excellent education. At 18, he and an Italian friend headed to the Dominican novitiate in France. Near Pavia, Italy, they were attacked by enemies of his family, who left the bodies of the two boys in the snow by the side of the road. Augustine was badly injured; his friend died. When he recovered from his injuries, Augustine continued to the novitiate. Augustine spent most of his life battling heresy: In his native Dalmatia, he fought the Manichæen heresy; in Sicily, Islam; in Hungary both. In every situation in which he found himself, Augustine gave proof of his virtue and good judgment. When Cardinal Boccasini came to Hungary as legate, he noted the wisdom and tact of his brother Dominican, and when he himself ascended the papal throne as Benedict XI, he appointed Augustine bishop of Zagreb in Croatia in 1303. This diocese was in chaos when Augustine assumed the cathedra. His three predecessors had all tried, but failed, to repair the ravages of heresy, plague, and schism. The new bishop began by reforming the clergy. He finished building the cathedral and made a complete visitation of his diocese. His work was to bring him into violent conflict with the government, but, spiritually, he restored the entire see during his episcopacy. Several charming miracles are related about Augustine. The river water of Zagreb was unfit to drink, so the Dominican fathers asked Augustine to pray for a new supply. At his prayer a fountain sprang up in the yard of the convent, abundantly supplying their needs. Another time he planted a tree in a little village and the leaves turned out to have healing properties. On one occasion, when Bishop Augustine was dining with Benedict XI, the pope, feeling that a missionary bishop must eat well to preach well, had a dish of partridge set before Augustine, who never ate meat. Because he did not want to offend the pope, he prayed for a resolution to the situation. The legend says that God turned the partridges into fish! Augustine was transferred from Zagreb to Lucera (Nocera), Sicily. Here he continued his holy government, using his characteristic gentleness and his gift of healing. He promoted devotion to Saints Dominic, Thomas Aquinas, and Peter Martyr–all brother Dominicans. Feeling that he was near death, he returned to the Dominican convent in Nocera to die among his brethren. 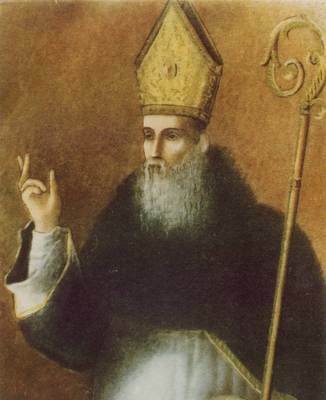 Under his statue in the cathedral of Nocera is the legend, “Sanctus Augustine Episcopus Lucerinus Ordinis Praedicatorum,” an indication of the veneration in which he is held.